Title: 03/15/1995 - Hazard Communication Standard requirements for labeling fire extinguishers. Preventive Fire & Safety Equipment, Inc. Thank you for your letter of August 26, 1994 requesting an interpretation of the Hazard Communication Standard (HCS) (29 CFR 1910.1200) requirements for labeling fire extinguishers. The issues you raised and our responses are provided below. We apologize for the excessive delay in responding to you. In your letter, you indicated that in servicing your customers' fire extinguishers, you periodically removed the extinguishers from the customers' premises and ship them to your facility to be recharged. You further indicated that the National Association of Fire Extinguisher Distributors (NAFED) had advised you that during shipment, each cylinder must be labeled with the appropriate cylinder warning label. Your first question was, after transportation is complete, should the appropriate cylinder warning label remain affixed to each extinguisher cylinder? Before answering your specific question however, the issue of coverage under the HCS must be addressed. Based on the manufacturers'/importers' hazard determination, if the fire extinguisher is classified as a hazardous chemical, then it would be subject to HCS labeling requirements. 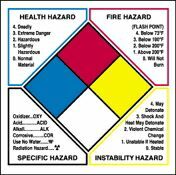 The HCS defines hazardous chemicals as any chemical which is a physical or a health hazard. Under the standard, a compressed gas (defined as a gas or mixture of gases having, in a container, an absolute pressure exceeding 40 psi at 70 degrees, or a liquid having a vapor pressure exceeding 40 psi at 100 degrees), is considered a physical hazard and therefore, is considered a hazardous chemical. In addition, several extinguishing agents (Halon 1211 and potential substitutes such as hydrogenated chlorofluorocarbons) are also considered hazardous chemicals by nature of their associated health hazards. Consistent with the definitions in the HCS, any fire extinguisher containing a hazardous chemical is subject to the requirements of the HCS. DOT also classifies fire extinguishers as hazardous materials (49 CFR 172.101) with specific exceptions noted at 49 CFR 173.306(c). Questions concerning DOT labeling requirements for shipping fire extinguishers should be directed to DOT at (202) 366-4488. Safety Emporium carries extinguisher signs, labels and more, including NAFED extinguisher labels. In the cases where you are acting as a distributor of hazardous extinguishing chemicals or charging the cylinder and creating a compressed gas hazard, you are responsible for ensuring that the extinguishers are labeled in accordance with paragraph (f)(1) of the HCS. In those instances where your services do not involve adding or supplying a hazardous chemical to the extinguisher or charging the cylinder your firm would not be considered a distributor and consequently would not be responsible for the labeling of the extinguisher. However, under 1910.1200(f)(8), as an employer you are prohibited from removing or defacing existing labels on incoming containers of hazardous chemicals, unless the container is immediately marked with the information required under the standard. In addition, for those fire extinguishers that must be marked or labeled in accordance with DOT's Hazardous Materials Regulations (49 CFR Parts 171 through 180), OSHA's newly promulgated Final Rule Governing Retention of DOT Markings, Placards, and Labels (29 CFR 1910.1201) requires that employers retain the required DOT markings, labels, and placards on the extinguishers until the extinguishers are cleaned and purged of any potential hazards. Your second question was, should appropriate hazard warning labels be affixed to fire extinguishers that your company services but does not remove from your customers' premises? Fire extinguishers that contain hazardous chemicals, as discussed above, must be labeled in accordance with 29 CFR 1910.1200(f)(5). Your customer (ie., the site employer) is responsible for ensuring that the required labeling of containers and also that MSDS are available to address the physical and health hazards of fire extinguishers in their workplace. The methods the employer will use to inform the other employer of the labeling system used in the workplace." The responsibility of providing the label information is clearly on the site employer who owns or controls the fire extinguishers and their use. We hope this response answers your questions regarding the HCS. We have enclosed a copy of the HCS for your reference. If you have additional questions, please contact Tom Galassi at the Office of Health Compliance Assistance at (202) 219-8036. OSHA 200 Constitution Ave. N.W. We are a Florida state licensed fire extinguisher certification company. We provide a service for businesses to have their fire extinguishers recharged and/or maintenanced to be in compliance with various local, state and federal regulating agencies. It has come to our attention through an association to which we belong to called National Association of Fire Extinguisher Distributors (NAFED) that the Department of Transportation has defined "Fire Extinguishers" as a hazardous material per Code of Federal Regulations, Title 49. The reason given to us that they are hazardous material is each one is a cylinder pressurized over 40 PSIA with a non-flammable gas. This coincides with CFR 49 Section 171.8 (cylinder) and Section 173.115 (b) (Compressed Gas, Class 2, Division 2.2). This also concurs with CFR 29 Section 1900.1200 (c). Also CFR 29 Section 1910.101 states "Compressed Gased, the implant handling, storage and utilization of all compressed gases in cylinders,... shall be in accordance with the Compressed Gas Association (CGA) Pamphlet P-1. In Section 3.1 of this pamphlet it states "Containers offered for shipment shall have their contents identified as prescribed by DOT and OSHA's Hazardous Communication Standard." In the process of servicing our customer's extinguishers, we periodically remove them from our clients premises and ship them to our facility to be recharged. NAFED has advised us that during shipment, each cylinder needs to be labeled with the appropriate cylinder warning label. DOT permits the use of temporary labeling. However, CGA Pamphlet P-1 Section 3.2.3 says that labels applied shall not be defaced or removed. Our question to OSHA is, after transportation is complete should the appropriate cylinder warning label remain affixed to each extinguisher cylinder. Also, should the appropriate cylinder warning label be affixed to extinguisher that are serviced but not removed from the customers premises due to the fact that primarily all of our clients are employers and it is an employees right to know of all hazardous materials. Please make this in the form of a formal interpretation. An expedient reply would be greatly appreciated.